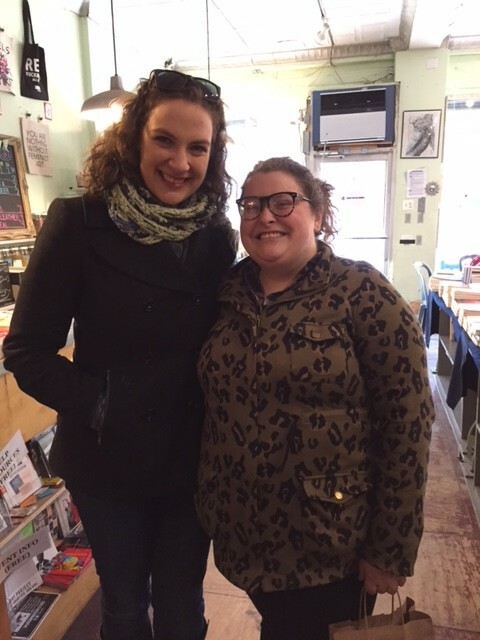 Current VCFA student Sara Ingle (right) visited NYC and the very first stop on her bookstore tour with friend Jackie was Bluestockings! 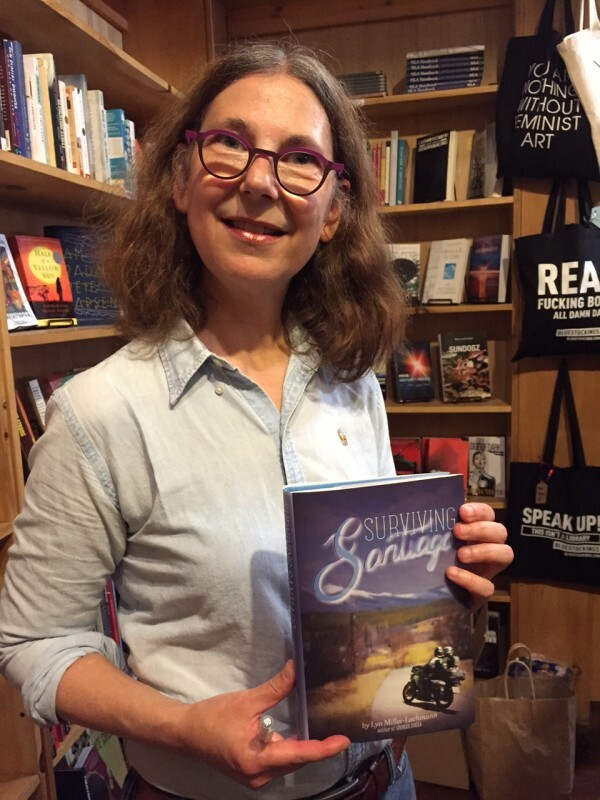 Last month I applied to volunteer at Bluestockings, the Lower East Side bookstore which hosted my launch of Surviving Santiago. The store uses all-volunteer labor, from the collective members to the staff with regular part-time schedules and a year or more of experience to the volunteers who have a once-a-week shift for three hours and/or fill in at other times. Aside from Bluestockings carrying my book (and being the only bookstore in Manhattan to do so), I have come to appreciate its selection of progressive books for all ages and the welcoming atmosphere there for people of diverse backgrounds, gender identities, and sexual orientation. In order to become a Bluestockings volunteer, one has to go through an introductory meeting. I’d expected this meeting to teach us how to use the register, check in and shelve inventory, and work the cafe area. Instead, it was a one-hour discussion of safe spaces. The staffers running the meeting pointed out that there’s no such thing as a completely safe space, but that we try for a “safer space,” always trying to do better and learn from mistakes. For instance, we ask which pronouns people want used in referring to them. We are also encouraged to express our own needs and concerns, as well as things that may be triggers or lead to conflict and misunderstanding. This was especially reassuring to me because I’m on the autism spectrum and have trouble with crowded spaces; I’m also likely to say things that are insensitive if I don’t know the rules. I appreciate a workplace where being autistic is accepted. I seriously doubt that any corporate bookstore would hire me; at my last attempt to be hired by a corporate giant, I didn’t get past the first round group interview even though they recruited me for the position because of my language skills. From my book launch party last June. I’ve already worked two shifts at Bluestockings and had a great time. I enjoyed talking books with the diverse customers and other volunteers. Several volunteers are high school students doing work-study internships. Yesterday, an author from New Zealand — here because his spouse was transferred to NYC for work — came in to inquire about volunteering. I put my just-arrived Moonbeam Gold Medal stickers on the store’s remaining copy of Surviving Santiago. (I have more stickers when that book sells and the store reorders.) I made sure the store gets copies of Margarita Engle’s Drum Dream Girl for the We Need Diverse Books #DrumItUp campaign this month. 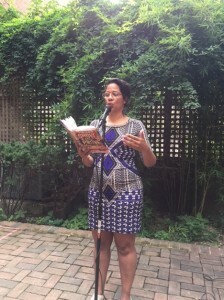 Sofia Quintero reads from her new YA novel, Show and Prove, in the garden of La Casa Azul Bookstore. I’m going to miss the store and hope it reopens, bigger and better, soon! Bluestockings plays an especially important role in the Manhattan literary scene now because La Casa Azul will be closing on December 19. Since 2012, La Casa Azul has served as a bookstore, community center, and safe space in East Harlem. However, demand for more community events as led bookstore founder Aurora Anaya Cerda to rethink the business model — specifically, to prioritize community space over bookstore stock. While La Casa Azul will continue to sell books online, Aurora will spend the next few months searching for a storefront that can accommodate larger events and staged performances. While rumors of a cafe are not true, she didn’t rule out the option. And books, of course, will be part of the plan. In the meantime, I will certainly miss La Casa Azul, which, like Bluestockings, welcomed authors of color, small press-published authors, and others whose books had been shunned by the chain and establishment indie bookstores and who had been made to feel unwelcome inside those stores. You may ask, why do we expect our bookstores to be safe spaces, any more than clothing boutiques, home improvement outlets, or other retail enterprises? I think it’s because independent bookstores thrive by fostering community. It’s something that can’t be done while shopping online, and for independent bookstores to survive while charging so much more than online competitors, they have to add value. The establishment independent bookstores operate as a kind of literary club, distinguishing between insiders and outsiders and in this way bestowing status on insiders. One of the establishment indies, McNally-Jackson, prides itself on supporting both translations and books in other languages, and in this way has become a source of community for people interested in international literature. 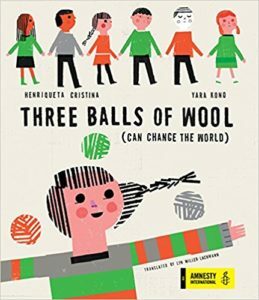 The store has made my picture book translation, The World in a Second, available to its customers. I used to be a regular attendee of the Spanish-language events, something I promised myself I’d return to — until I discovered Bluestockings and what it means to be a safe(r) space. A community that’s built on accepting and welcoming each other the way we are — LGBTQIA, of color, disabled, poor, young, old — just seems more comfortable to me that one where we have to fit into a mold that those with money and power have established for us. I hope La Casa Azul will reopen soon — there’s certainly demand for what they offer. And Anderson’s is a wonderful bookstore! They always sell the books of speakers at NCTE, and I’m grateful that they included Surviving Santiago this year.